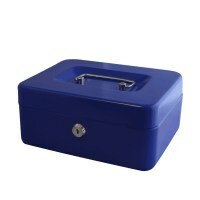 Cash Boxes - A small locked box used to store money or valuables, for use in the office or home. A Cash box could be used to store Petty Cash, keys or receipts. Available from Asec Security in blue or red.